Alex Iwobi was on target for Arsenal as they brushed aside Huddersfield 2-1 in a Premier League game at the John Smith's stadium on Saturday evening. While Super Eagles star, Alex Iwobi started on the left side of the visitors attack, Danish-born Nigerian midfielder Phillip Billing started on the bench for the first time this season and remained on it for the entirety of the game. 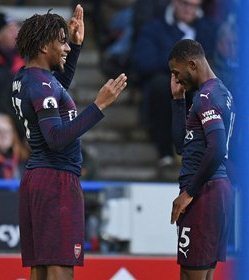 Iwobi got his team into the lead after 15 minutes when he volleyed past Ben Hamer after teammate Sead Kolasinac have picked him out at the far post, the ball taking a huge deflection off Terence Kongolo on its way in. The Nigerian had another chance to add further gloss to the scoreline in the second half but saw his shot parried to safety by Hamer following a swift Arsenal breakaway. He was replaced by Joe Willock in the 88th minute after a very instrumental display.